Leupold 56160 Rifleman 3-9x40mm Wide Duplex Reticle Riflescope FREE SHIPPING! The Rifleman 3-9x40mm Wide Duplex Reticle Riflecope from Leupold offers versatile long-range accuracy at an affordable price. Its precision cut lenses and ruggedized construction work together to provide the image clarity needed to hit the target in any environment. The scope's powerful optic system features fully coated lenses ensure maximum light transference that results in a brighter picture with superior clarity. Combine this with a variable zoom and you get a scope the allows shooters to see distant targets as if they were within arm's reach. The riflecope's body is fabricated from a single sheet of military-grade aluminum and provides the sturdy base needed to withstand the demands that come with tactical mission work. To further add to its all-weather prowess, the Rifleman has been O-ring sealed and its tube nitrogen purged to prevents moisture or fog from distorting image quality. 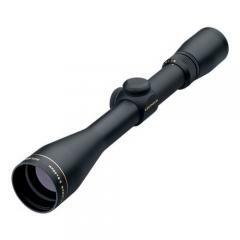 ©2002-2019 CopsPlus.com: Leupold 56160 Rifleman 3-9x40mm Wide Duplex Reticle Riflescope FREE SHIPPING!